I would like to be here this weekend. 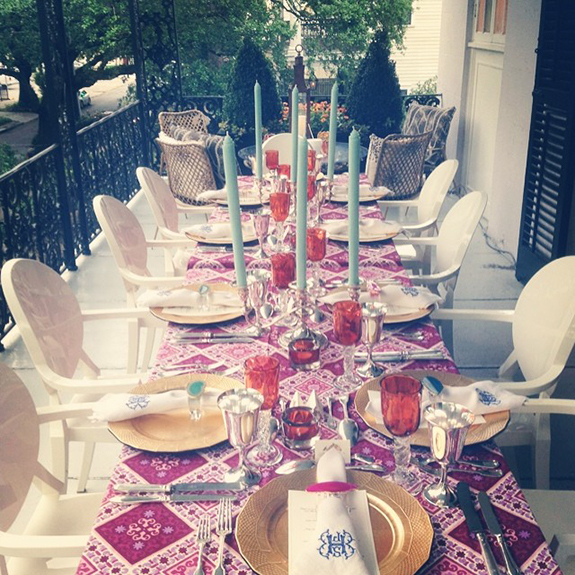 A New Orleans balcony all decked out for a summer soiree. A wrought iron porch, modern Louis chairs, a beautiful tablecloth adorned with gold chargers, silver goblets, towering candles and OF COURSE a bananas beautiful monogrammed napkin...because this table belongs to Jane Scott Hodges of Leontine Linens. You know this dinner party was amazing. Do you have any summer entertaining on tap for this weekend? Hope this provides a little inspiration. Whatever your plans, enjoy the weekend and see you next week! The napkin rings are pretty special too. Gorgeous!